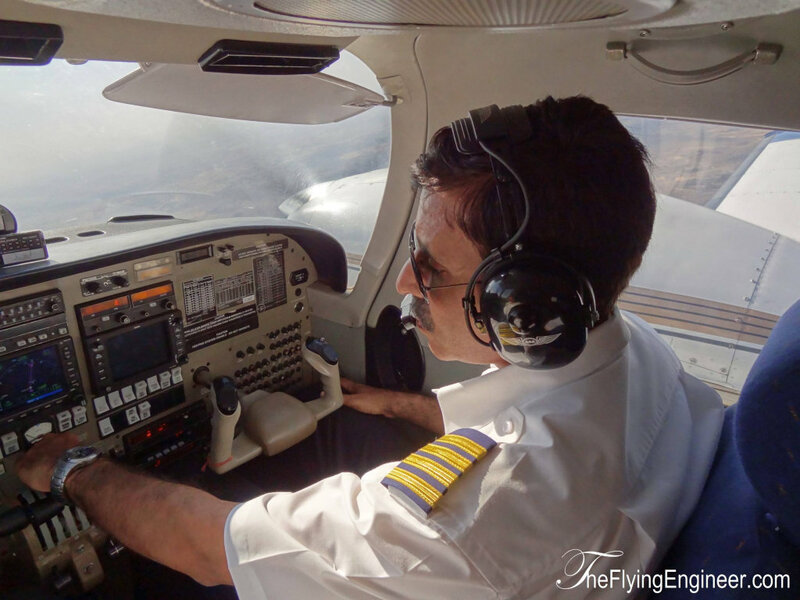 The “CFI Feature” will feature the Chief Flying Instructors of four flight schools in India: IGRUA (click), NFTI, Chimes Aviation Academy, and GMR-APFT (in no particular order). The first two institutes are managed by CAE, to a larger extent at NFTI due to CAE’s 49% ownership. The last two are academies that are more flexible, offering an exclusive PPL as well. All schools, save Chimes, have some foreign component in them, and all are dominantly Diamond Aircraft (DA-40 and DA-42) operators, except Chimes which operates Cessna 172s and a Piper Seneca IV: the only flying Seneca in the country, as of today. GMR-APFT has diesel engine Diamond DA-40s, and IGRUA will soon be a full-fledged, first of its kind aviation university. NFTI is known for its IndiGo Cadet Pilot Program. This week, we focus on Chimes Aviation Academy’s CFI, who retired from the Indian Air Force (IAF) as a Wing Commander. He served the Air Force for over 22 years. His childhood fascination for airplanes made him join the National Defence Academy after class XI as an Air Force cadet, and joined the IAF upon graduation. He has the distinction of being experienced on both fixed and rotary wing aircraft. A helicopter Instructor at the IAF, he also flew and picked up 1000 hours of experience on fixed wing airplanes (HJT-16 “Kiran”, HPT-32 “Depak”), at the forces. This unique combination makes today’s interview special: understanding a pilot, and instructor whose experience has a rare mix of both types of aircraft. 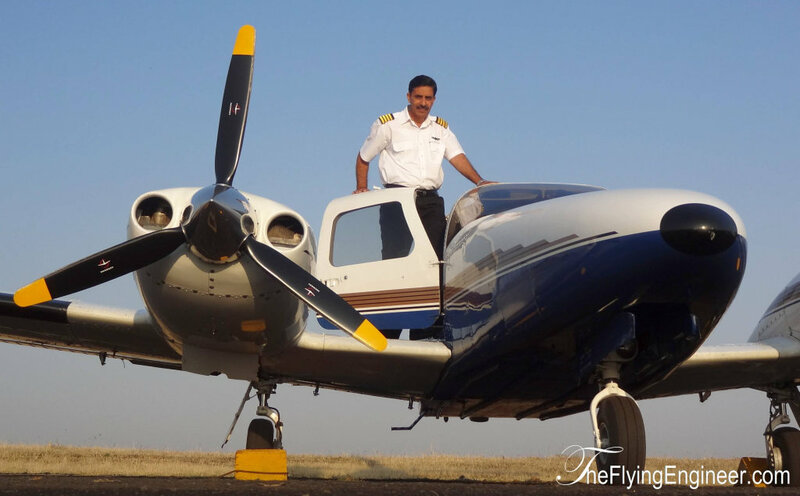 With more than 5600 flying hours to his credit, Neel Kamal is now the Chief Flying Instructor at Chimes Aviation Academy, Dhana, Madhya Pradesh. As the head of flying training at Chimes Aviation Academy, and a rotary and fixed wing pilot, we get to better understand the CFI. 1. You were an instructor at the Air Force. What, according to you, are the traits that must be exhibited by a flight instructor? Neel Kamal: A flight instructor has to have highest standards of discipline (both in air and on ground), mature behaviour and skill level. A flight instructor also has to have a lot of patience and some knowledge of human psychology. A student pilot sees his instructor as a mentor and his hero. He follows the example set by his instructor, so an Instructor has to lead by the right example. Most of the people see Aviation as a glamorous thing and get attracted to it. In fact aviation requires lot of hard work and strict discipline. This has to be inculcated in the student pilot by the instructor. Taking short cuts does not work in aviation. Neel Kamal: Like any other field, there are some “natural” born flight instructors. You have to have a flair for instructing to be a good flight instructor. A good pilot does not necessarily make a good instructor. However, being a good instructor is not something which cannot be acquired by not so gifted “born” instructors. They just have to put in some extra effort to be a good instructor. 3. The transition to fixed wing: how and why? Neel Kamal: In Air Force I mainly flew helicopters and I loved it. It gave me an opportunity to be able to see places which I would have never seen in my life otherwise. It also gave me an opportunity to develop my natural flying skills as helicopters normally operate in remote areas with no or minimal of Radio and Navigation aids. I did not want to spoil this wonderful experience once I came out of the Air Force. I also wanted to do something different. Being an Instructor in the Air Force, I also flew fixed wing and had close to 1000 hours. So I decided to fly fixed wing so as to operate from more organised places. 4. Does a rotary wing experience have any implications on fixed wing flying? Neel Kamal: There are some differences in rotary and fixed wing flying but the basic set of skills required is the same. These set of skills and knowledge gained while flying helicopters surely helps you when you shift to fixed wing flying. To give an example, the knowledge of weather and ability to predict it that you develop while flying helicopters surely helps in assessing the weather even when you fly fixed wing aircraft. 5. Which is easier, and which is more fun? Neel Kamal: Helicopters are inherently unstable whereas fixed wing aircraft are stable by design. So it is more difficult to learn to fly a helicopter than a fixed wing aircraft. Once you get over the initial learning part both are the same. As regards the fun part, both are fun to fly if you enjoy flying. I had my fun flying helicopters in the Air Force, now I am having fun flying fixed wing. 6. What are the challenges associated with each type of flying? Neel Kamal: Helicopters normally operate in remote areas due to their ability to land in small spaces where helipads can be made. These remote areas have poor communication and navigation facilities and normally have adverse weather conditions. Operating in these areas is the major challenge in rotary flying. As regards fixed wing aircraft, due to their higher speeds and the limitation of landing on the runway, landing in bad weather or poor visibility conditions posses the biggest challenge. 7. What is your take on General Aviation in India? 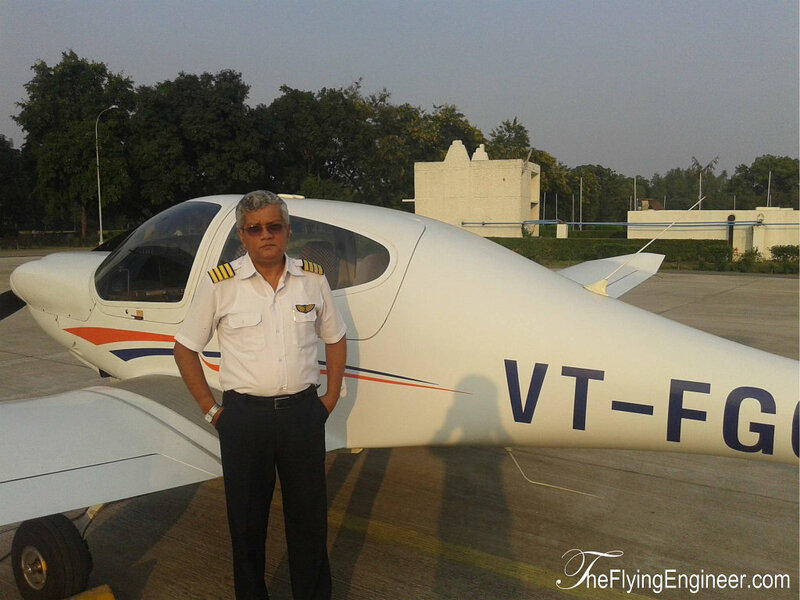 Neel Kamal: There is a lot of scope of expanding the general aviation in India. I have met people who want to learn flying and have their own aircraft but are deterred by various factors. The two major deterrents are lack of infrastructure and present rules and regulations. Lack of infrastructure makes it a very expensive and difficult proposition to even park an aircraft at any airport, let alone fly it. Our present rules and regulations are not very user friendly and I believe there are too many of them, which makes it difficult to comprehend them. 8. Your opinion on Fixed wing flying training in the country? Neel Kamal: The aviation boom in India attracted all kind of people to fixed wing flying training. Like in any other field, some were serious players with good intentions and some came in to cash in on the sudden requirement of additional pilots. With the down turn in aviation sector there has been a shake up. Present policies and dwindling number of students has made it hard for the flying training schools to survive. Today some of the flying training schools in India are imparting better training than those being imparted by a lot of schools abroad. I can say this as I have flown with lot of young people who have done their flying training abroad. 9. 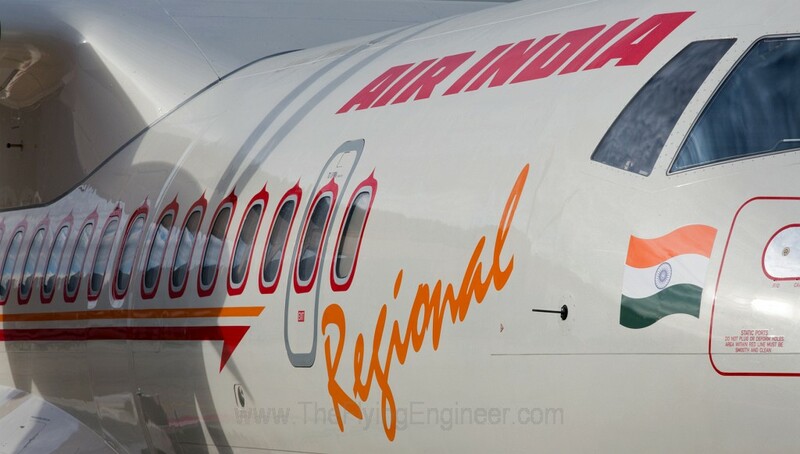 If there is something you’d like to change in Indian aviation, what would it be? Neel Kamal: In India, aviation is treated as something for the elite and rich. This perception is visible in our policies and in the mind set of people joining aviation. This has to change for aviation to grow and flourish in India. The “CFI Feature” will feature the Chief Flying Instructors of four flight schools in India: IGRUA, NFTI, Chimes Aviation Academy, and GMR-APFT (in no particular order). The first two institutes are managed by CAE, to a larger extent at NFTI due to CAE’s 49% ownership. The last two are academies that are more flexible, offering an exclusive PPL as well. All schools, save Chimes, have some foreign component in them, and all are dominantly Diamond Aircraft (DA-40 and DA-42) operators, except Chimes which operates Cessna 172s and a Piper Seneca IV: the only flying Seneca in the country, as of today. GMR-APFT has diesel engine Diamond DA-40s, and IGRUA will soon be a full-fledged, first of its kind aviation university. NFTI is known for its IndiGo Cadet Pilot Program. TK Chatterjee: Being “natural” always helps. However, it is not difficult to learn to teach provided such learning is done in an organised manner from specialists. TK Chatterjee: Fixed wing flying training is imparted by about 40 institutions in the country. Since aviation is cash intensive business, most of them have very limited assets. Hence, quite naturally, there is a clash between commercial interests and quality of training. Small enterprises are not very clear whether to treat trainees as “students” or “clients”. Failures are not heard of in this industry! Bigger enterprises are in a better position to deliver quality due to volume of business. A centralised testing authority for issue of license will also help in standardisation of training. A beautiful flight at Bijapur: Post the crazy winds, and long wait! This video, this single video, describes in absolute brief what we do, and what we face everyday. We hope to take-off at a designated time, but the winds do not always stand in our favour, making us not fly all our plans. When this video starts, you will see Nikolai explaining to the Deputy Commissioner, Bijapur, why the planned 7:00AM flight around Bijapur did not happen: he was very uncomfortable with the winds. The winds were anything but steady, and were pure crosswinds to the length of the field we hoped to use for takeoff. Wind speeds touched 20km/h, gusting. For the Powered Para Glider, which lacks a rigid wing and cruises at between 40-50km/h airspeed, such winds are anything but comfortable to fly with a trike, passenger, and a non-aerobatic para-gliding wing. The video shows the windsock, and how it lacked direction, and was inconstant with winds experienced just 100 meters away. We also witnessed a dust-devil which (very hilariously, I must say), Nikolai verbally reacted to. Finally in the evening, when things appeared to be comparatively relaxed, but still turbulent, Nikolai took up in his aircraft his crew member, who had with him a bag full of pamphlets printed by the Election Commission, to drop from the air. Attached to Nikolai’s glide was a banner, with words in Kannada urging people to vote. The takeoff was a close shave, as Nikolai struggled with the uncooperative winds, which forced him to use the width of the field as opposed to the length. Notice how close the powered para glider came to the football goal post and proximate trees, before climbing out to between 200 and 300ft AGL. Nikolai still had to struggle with gusts in flight! This kind of flying is absolutely off-beat, with a non-rigid wing, low flying, and an “open” aircraft. The flights (weather permitting), co-ordination, and conduct are absolutely satisfying at the end. What finally brings a smile to us is the crowd, that cheer and look up at the aircraft. In one shot, the whole city or town is abuzz with excitement, while we drop the pamphlets, attaining our goal of effectively reaching out to almost every eligible voter in the most unexpected of ways: from the skies above. September 2012 was when Radka told me of her wish to return to India for another performance. 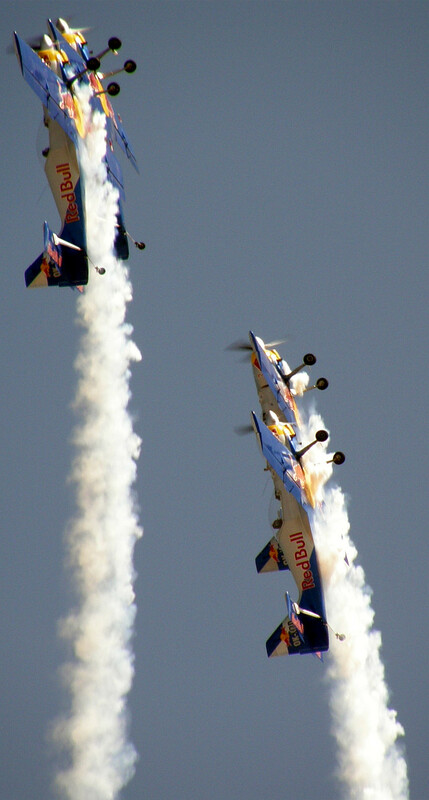 January 2013, The Indian Government suddenly invited the Flying Bulls to take part in Aero India 2013 at Yelahanka Air Force Base, Bangalore. A swift response followed, with the Flying Bulls aerobatic team disassembling their aircraft and shipping them to India. Radka, the formation lead of the Flying Bulls, in the meanwhile, talks more about herself, and her flying. Click Here to Discover more about Radka and her flying in this exclusive interview, which will also be published in the Air Show’s special issue of SP’s Airbuz. The Flying Bulls: They’re back! If you’ve flown a Cessna 172 with only 2 people on board, you know how the aircraft performs with its 160hp engine at approximately 1,000kgs takeoff weight. 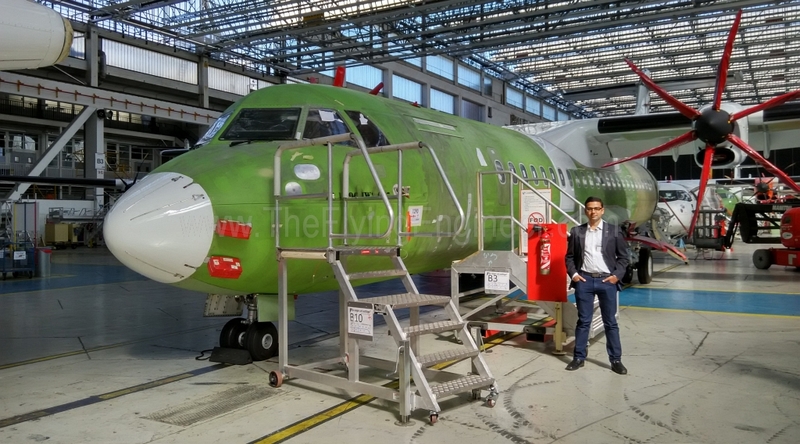 Now imagine a 720kg –all up airplane with a 300hp engine. With more than 2.5 times the power ratio of the Cessna 172R, the capabilities of Zlin Z-50LX, an aerobatic airplane flown by the Flying Bulls Aerobatic Team, can only be imagined. When Radka Máchová, formation lead of the Flying Bulls Aerobatic Team, sent me a message that she’ll be performing at Aero India 2013, I was all too excited to meet her again. This time though, I want everyone – who will look up to their performance in awe – to go beyond the aerobatic display, and right into the airplane, right beside the three men and one woman who bring mere metal to life. 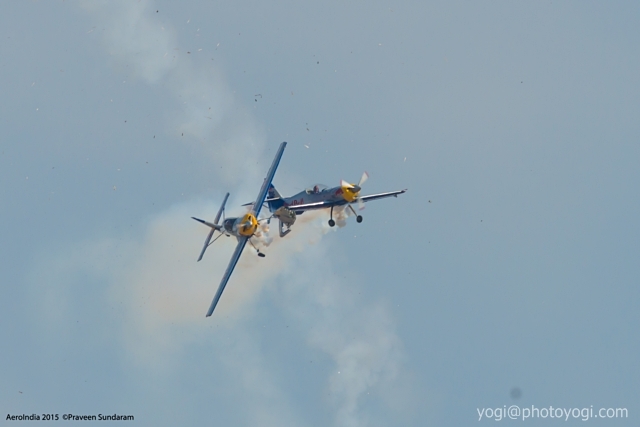 Honestly, the first time I saw the Flying Bulls perform: it was a set of four, propeller driven colourful airplanes that left behind a trail of smoke in the sky as they flew some manoeuvres together. The flying was brilliant, the display fantastic, but I couldn’t see beyond. I accidently bumped into Radka Máchová, when she passed the Honeywell stall that I was manning. I instantly recognized her, and got a photo clicked with the “Super Flying Lady”. She’s well known; very well known, but on ground, she doesn’t fly with the nose high. Full of energy, she left behind an aura that egged me to know more. No phone numbers, but an internet connection was all I had to read up on Radka. With the little I knew of her, and her well founded passion for flying, I stepped out this time to watch them perform. I must tell you, their performance seemed so much better, with the thought that someone I’ve met, someone I know something about, is up there, flying that airplane. It’s no longer a machine, but a soul that’s come to life. But there’s so much more to know. To most, the first glimpse at an airplane with propellers is, “Oh, that’s old technology”. Not really. The airplane they fly, the Zlin 50LX, is no longer in production, but its performance is something that most jets -including some fighter airplanes – cannot match. The cockpit is absolutely simple: there are hardly any instruments, and nothing fancy that people are used to seeing in modern 4th generation airplane cockpits. This is where you start appreciating the team: It’s amazing precision in tight formations: all possible only by experience, practice, and most importantly: skill. Eyes, ears, and a good feel of the airplane: eliminate the need for the on board instruments. Then what is it that separates these famous aerobatic pilots from the rest? What drives them to perform? What else do they do apart from flying? What did they do that got them there? What is it that they feel when they fly? All this and more, when I speak to Radka Máchová, as she gears up to fly with her team at Aero India 2013, between the 6th and the 10th of February, 2013.